Stumbled over this when I got their email notification for their Propstore 2017 Live Auction. The catalogue isn't out yet, but they are showing a picture of a Darth Vader tour helmet. The Y-Wing looks a bit weird and not really screen used neither production made, but that Vader helmet looks really nice. Assume it will be a top seller. The Vader helmet is listed as an ESB touring helmet from 1980, but it looks to me more like a ROTJ touring helmet, which looks a lot like the DPDLX (since we generally believe it was based on a ROTJ touring helmet). The Vader touring helmet I saw and photographed when I was a wee lad in July, 1980 for the ESB theatrical release promotion looked much different. It had the ANH size chin vent and a widows peak that was pointed but smooth. Last edited by banthapoodoo on Wed Aug 09, 2017 5:42 pm, edited 1 time in total. Cool. I forget, but have you shared that image here? I've just added jpg links to flickr for the images in that post so they will appear automatically without needing to use the Google drive link. Awesome. I still have those saved. Very nice pictures indeed. I'll have to check out flickr. 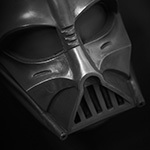 An ESB Vader helmet cast. Pure awesome. They also have a few other bits of Star Wars stuff, but this was the one that caught my eye. Wow....thats the nicest cast i have seen for a Long time on an auction. I like how, in these photos, we can see how "flat" the bottom of the dome has been made. That is the big ANH/ ESB difference. It sold. Anyone known to the community who got it? I would love to know who got it. I received and email from Mark asking for help to win the auction. I would have but I did not have any money at the time. I wish he got it.